The second largest and second most important city of the Czech Republic is also the traditional Moravian metropolis and the historical residence of the Premyslides family. The municipal privileges were given to the town by the Bohemian King Vaclav I in 1243. The Spilberk Castle, which creates a silhouette in the town, was originally a Gothic palace with two chapels and later became a Baroque fort. In the 19th century the dreaded prison for political prisoners - known as "The prison of the nations" was built there. The Gothic St. Peter and Paul's Cathedral dominates Petrov Hill. 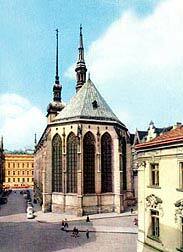 At the beginning of the 16th century an original portal of the Old Town Hall with a Gothic vial was built in Brno. A number of other historical buildings should be mentioned, such as the monastery buildings of clerical orders, the Parnas Baroque-naturalistic Fountain, the Episcopal Courtyard, Renaissance palaces of the nobility from Lipe and Kunstat, St. Jacob's Church and the Hausper´s Palace, which is now a residence of the "Husa na provazku" Theatre. Brno also became a significant center of modern architecture. The Klein's Palace was built in a modern style at the end of the 19th century (cast-iron elements, flush toilet, etc.). The Mahen´s Theatre was the first theatre to use electricity. Structures, which were built in the Secession, Early Modernism and functionalism style, are among the most important ones in the country. It is impossible to miss out on the Tugendhat Villa, which is an excellent example of the functionalist style of European significance dating from 1929, designed by the German architect Mies van der Rohe. Also the complex of unified buildings of the Brno Exhibition Center from the period between the thirties and sixties belongs to this style. About 50 trade fairs are organized here annually. 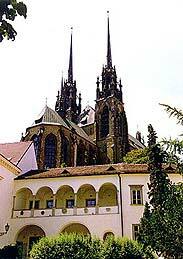 Brno also offers lots of attractive destinations outside the town center - such as the Zoo Park, a botanical garden, an arboretum and large garden parks. The motor-racing circuit with a new Masaryk´s circuit hosts the World Motorcycling Championship known as the Grand Prix of the Czech Republic.